Can’t Get Rid of Sugar Ants? 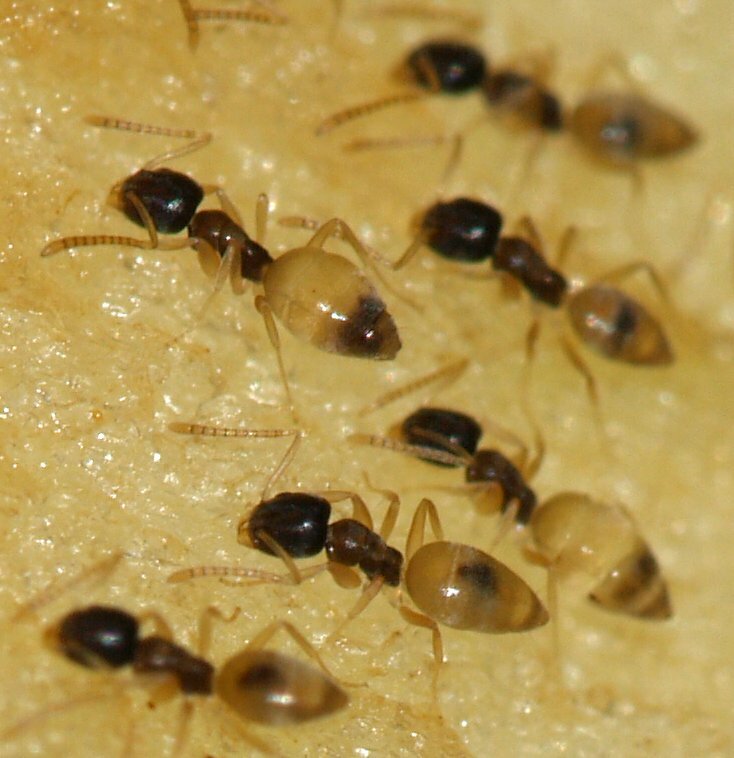 Sugar ants in the West Palm Beach area are the most common pests new clients call us about. Upon inspecting, we’ve found that about 90% of the time these Sugar ants are actually Ghost Ants. Ghost ants are very tiny and hard to see (hence the name.) Their colonies can actually have multiple queens, which we have found to be the main reason people are unable to successfully control them. Unless a treatment eliminates all of the queens, they will eventually all return as they seek water sources. 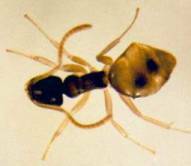 Ghost ants love tropical climates, making them largely a Florida, Texas and Hawaii pest problem. The farthest North active field colonies had been reported in Florida was in Gainesville. There may be ghost ants further north but they are generally confined to greenhouses or other structures that provide conditions allowing ghost ants to survive. Ghost ants are extremely small, between 1.3 to 1.5 mm long. The top half of ghost ants tend to be a dark brown with the bottom half appearing to be an opaque or white/yellow color. The size and coloring of these ants make them very hard to see. In homes with dark granite counter-tops, it can be almost impossible to see ghost ants in these areas without the use of a flashlight during a close inspection. Ghost ants are attracted to your home because there are insects such as aphids, scale, and whiteflies feeding on the plant material on your property. As these insects feed on the plants, they secrete a substance called honeydew which is a food source for ghost ants and other bugs. You’ll know for sure you have honeydew on your plants if you see a black mold type substance growing on the leaves or if you look closely and see insects stunting the new plant growth. During our home pest control treatments, we treat these plants to eliminate the insects feeding on them which will then eliminate the food source for the ghost ants – making your home a less attractive target! When these ants are in the landscape around your home, it is inevitable they will eventually find their way inside without preventative treatments. No amount of caulking will be enough to keep them out since they are so small. 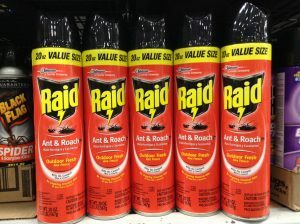 From our experience, the main reason people are unable to get rid of ghost ants is because they are spraying over the counter products from big box stores. These products are great at killing the ghost ants instantly, so it seems like it’s working. The problem is that the active ingredient in these products usually interferes with the pheromone trails these ants follow, causing them to split trails into different rooms, creating new queens and new colonies in a process called budding. 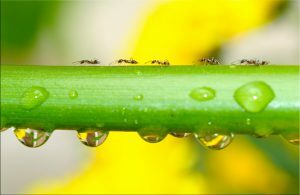 To successfully get rid of these ants, we rely on non-repellent treatment methods so that the ants may survive for a few days, long enough to carry the products we apply back to their queens to eliminate all of the colonies in and around your home. With any pest, it’s best to use a variety of treatment methods simultaneously to increase the likelihood of success in eliminating them. With ghost ants, the treatment must be sensitive to the fact that if any treatment is too strong, it will kill them before they can bring any product back to their colonies. We start on the interior of the home, by applying a professional grade ant bait like Intice Thiquid (Borax) along active ghost ant trails. When applying, it’s important to place small drops of gel bait in many places along a trail. Large goblets of liquid or gel bait won’t increase the effectiveness of the treatment and will create a costly mess more than anything. After the interior trails are baited in areas inaccessible to pets and children, we apply a targeted crack and crevice spray such as Alpine WSG directly onto active trails. This product does not kill ghost ants on contact. By allowing them to survive a few days, they inadvertently carry it back to their colonies and spread it among other ants while sharing food. On the exterior of the home, we will apply another spray, often Termidor, to ghost ant trails and potential entry points. This is another product that will not kill the ants on contact. As you can see, a variety of products are used to enhance the control of this persistent pest. Once ghost ants are completely eliminated from the inside of your home, it’s time to focus your prevention efforts on the exterior. By following product labels, an exterior spray and bait barrier can be applied to keep them from returning. If applied properly, a quarterly treatment should be sufficient but we would not recommend trying to stretch out preventative applications any further than that. UV rays and moisture will degrade even micro-encapsulated products within a few months. Make sure to inspect the exterior of your home for plants and tree branches that may be touching the home. These act as bridges for ants to cross over exterior treatments that are applied to the home foundation. If possible, trim any plants and branches off of the house. This will also help prevent cockroaches and rats from accessing your home. During preventative exterior treatments, focus on inspecting and treating plants and trees to ensure no insects are producing honeydew. While properly applied treatments are extremely effective, it’s not worth risking a failure of control by allowing conducive conditions to attract ghost ants and other bugs to your property. If you just can’t seem to get rid of ghost ants no matter what you’ve tried, reach out to us. We’d be glad to help if you’re in our service area which ranges from Jupiter to West Palm Beach to Delray Beach and Boca Raton. If you aren’t in our service area, reach out anyway, we’d be glad to provide free advice or a referral if one of our many friends in the pest control industry is in your area.